Civil society representatives from across the African continent urged Governments to take ambitious action against climate change. These were some of the recommendations during a Climate Justice Dialogue: shaping an equitable climate change agreement responsive to Africa ahead of the Third Climate Change and Development in Africa Conference (CCDA III) which runs between October 21 – 23 in Addis Ababa, Ethiopia. 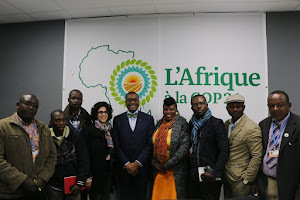 The Dialogue, which was also attended by former Heads of State, was organized by Pan African Climate Justice Alliance in partnership with Mary Robinson Foundation – climate Justice and World Resources Institute. Participants, drawn from 23 African countries from diverse sectors such environment, indigenous peoples, small-holder farmers, women, youth and faith based groups came together to discuss climate justice narratives and to build alliances to propose strategies for African leaders and governments to get a fair deal for Africa at the international climate negotiations. Speakers at the event, who included former President of Botswana Festus Mogae and former Irish President Mary Robinson observed that while the risks of climate change for future generations remain of major concern, the need to adapt and build resilience for the current generation cannot be ignored. It was further observed that any decisions made in dealing with climate change need to support the right to development. All speakers and delegates agreed that in order to achieve an equitable, ambitious international climate agreement, all stakeholders need to realise the injustice of climate change. The key messages arising from the the event, organised by Pan African Climate Justice Alliance (PACJA), the Mary Robinson Foundation – Climate Justice and the World Resources Institute will be presented on Wednesday 23 October to the plenary of the CCDA III. At COP 17 in Durban, governments agreed to launch a new round of negotiations that will result in adoption of a new agreement in 2015 under the U.N. Framework Convention on Climate Change. To capitalize on the promise of Durban and to build an atmosphere of trust and reciprocity between countries, issues of equity will have to be discussed and reshaped in an open and constructive manner. The World Resources Institute (WRI), Pan African Climate Justice Alliance (PACJA) and Mary Robinson Foundation – Climate Justice are facilitating the Climate Justice Dialogue to ensure that the new agreement is informed by science, considers the specific needs of the most vulnerable populations and catalyzes sustainable development. For more information on the Climate Justice Dialogue please visit www.climatejusticedialogue.org. Along with their participation in the ongoing third Climate Change Conference on Development in Africa (CCDA III), the Pan African Climate Justice Alliance (PACJA), the Mary Robinson Foundation – Climate Justice and the World Resources Institute held a civil society workshop to articulate and reflect the concerns of African stakeholders in the context of domestic/international climate policies and global cooperative action on climate change. The organizations have worked with the African Climate Policy Centre (ACPC) to ensure that equity is addressed in the agenda of CCDA III so that messages arising from the workshop will be able to feed into the Conference proceedings.